Wow, looks like it's VERY happy there! 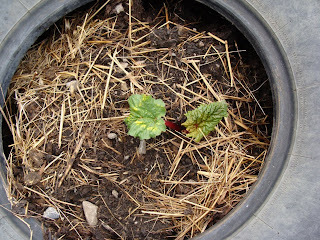 I'm itching to pick rhubarb too, but have to wait because I divided the crowns this spring. 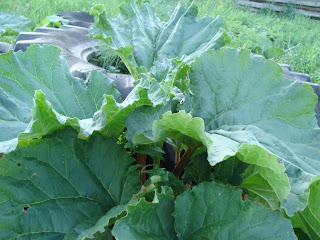 Looks like the rhubarb is working out...I had to get some rhubarb plants this year. We dug some from another garden and I was told it's pretty hard to get it to not grow. Can't wait 'til I can actually use it though -- just like a new raspberry plant, requires so much patience! Wow! What a crop. :) I'm not sure I'd be able to resist cutting enough for a rhubarb crisp. I don't know. I think I would let it be this year, and wait until next year. You will be glad you did when you see how well it does next spring. It is tempting though, I know. Mmmm, I can just smell it cooking! OK Barbee, I promise on my gardener's honour that I won't touch it this year. I'll have to make do with giving it admiring glances every so often!